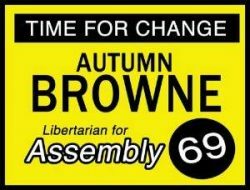 The Libertarian Party of California is Pleased to announce that reservations are now open for the 2012 Convention of Delegates. Follow the links the right for detailed information on what promises to be one of the best conventions we’ve held yet. “Sponsors of even the most embarrassing, inane and fraudulent infomercials have to pay for their own air time. They can’t force TV stations to run their ads for free by threatening to shut them down. The Libertarian National Committee endorsed the California ballot initiative “Regulate Marijuana as Wine” in December, by a vote of 14-0 (with 2 abstentions), according to Mark Hinkle, Chair, Libertarian National Committee. While most Libertarians would rather have no regulation on marijuana, they believe that this is an incremental step in the right direction. Click here to see this measure’s Facebook page. The So Cal Libertarian Party Conference is being held this month on Jan. 21, 2012, at 11am, at Geezer’s Green Room, located at 12120 Telegraph Road, in Santa Fe Springs. Tickets are $25 for all speakers and a sandwich buffet lunch. The first Libertarian Party of Orange County (LPOC) Monthly Meetup of the New Year is set for Tuesday, January 10, 2012, 7:00 PM, at Karl Strauss Brewery, located at 901 South Coast Drive, Costa Mesa, CA (map). (714) 546-BREW.